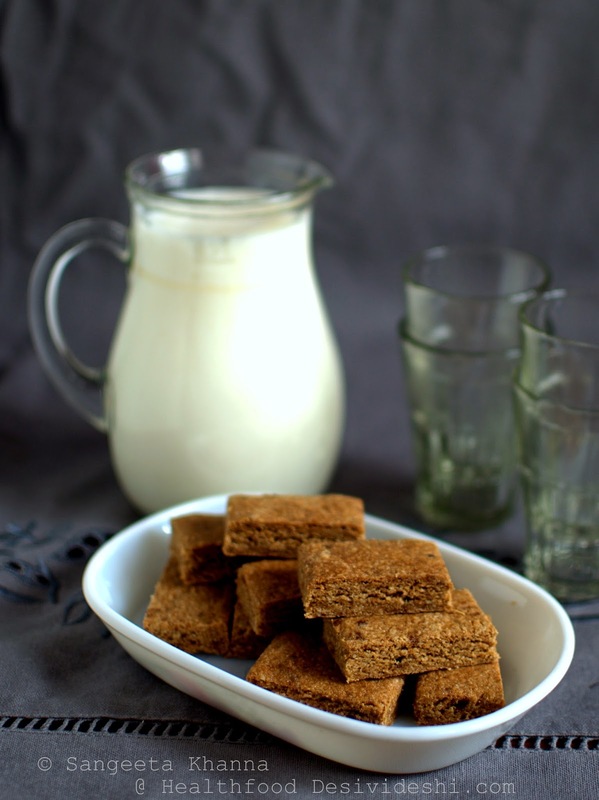 Ginger and jaggery has been a favourite combination of flavours, as Indian as it can be. We like it in our masala chai in winters, we love ginger and jaggery in the rich gond ke laddu we make in winters and I remember we used to have gud ke cheeley (whole wheat jaggery pancakes) with a generous lashing of ginger in it. I have made ginger and jaggery cookies with whole wheat for a healthy snacks brand I used to consult but that had some more spicy flavours to it. 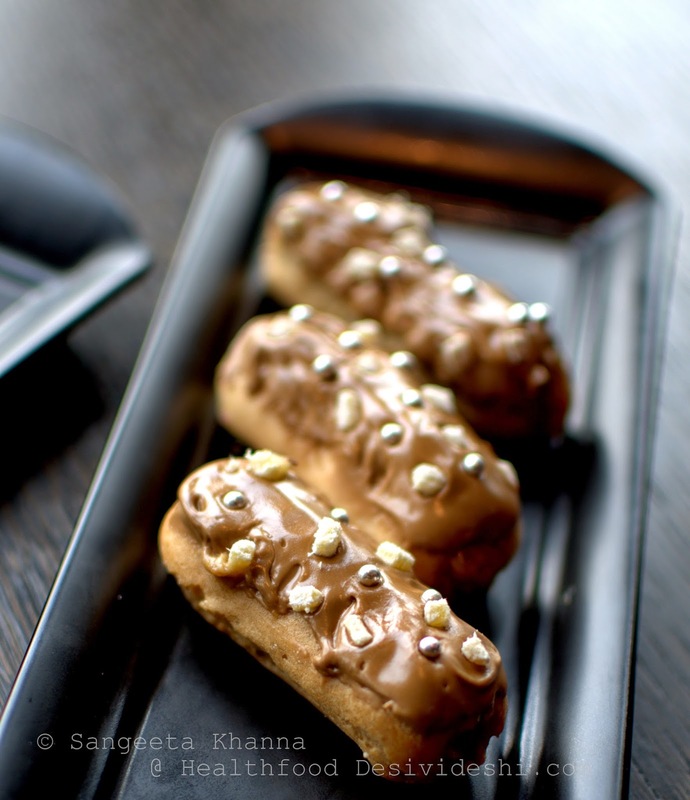 Using ginger and jaggery in a gluten free energy bar without the usual ginger-bread cookie spices wouldn't have come to my mind until I tasted some yummy dainty eclairs at Le Meridien. Yes one of the local flavours infused in the Parisian classic eclairs was ginger and jaggery and how we loved it to bits. 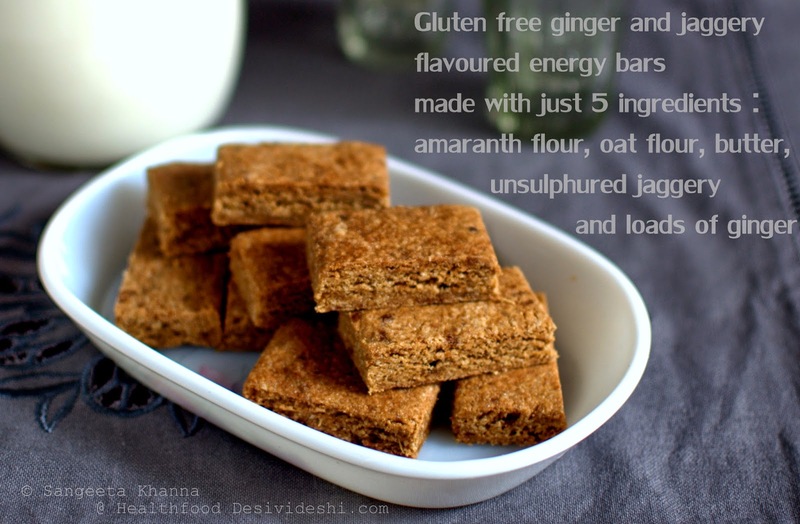 The ginger and jaggery flavoured energy bars were baked using alternative flours (oat flour and amaranth flour) and is completely gluten free. Dainty eclairs stuffed with jaggery ginger pastry cream, topped with some more and sprinkled with candied ginger and peppermint confetti. Parisian delights with a local twist. You know when the loveliest of flavours adorn the most sinful food? Thank God the eclairs were really small and we shared each eclairs that we tasted. Anita and me shared three eclairs between the two of us. And yes, this inspired me to combine healthy ingredients with the loveliest of flavours. 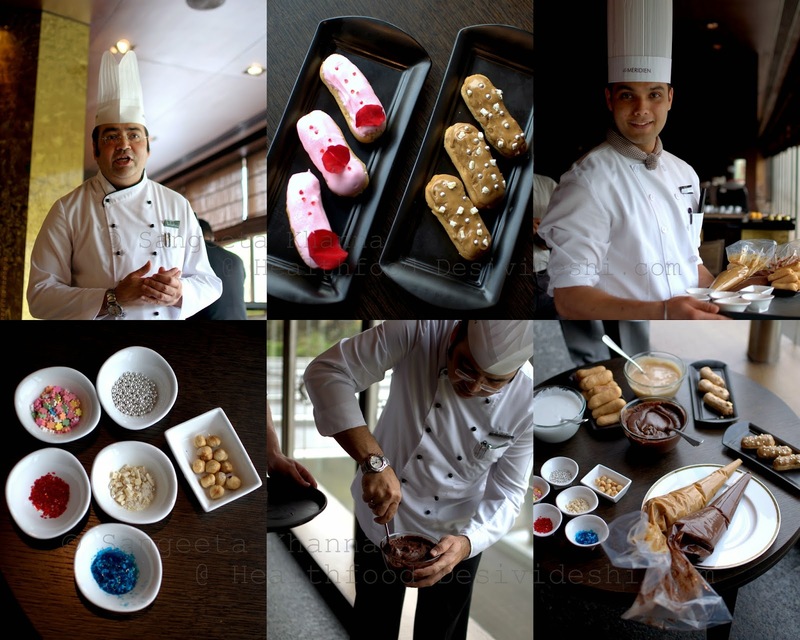 Chef Vikas Srivastava introduced us with the techniques of cooking the choux pastry before piping it and baking it to light fluffy eclairs. A small hole is made at one end so it cool evenly and there is a place to fill the pastry cream. 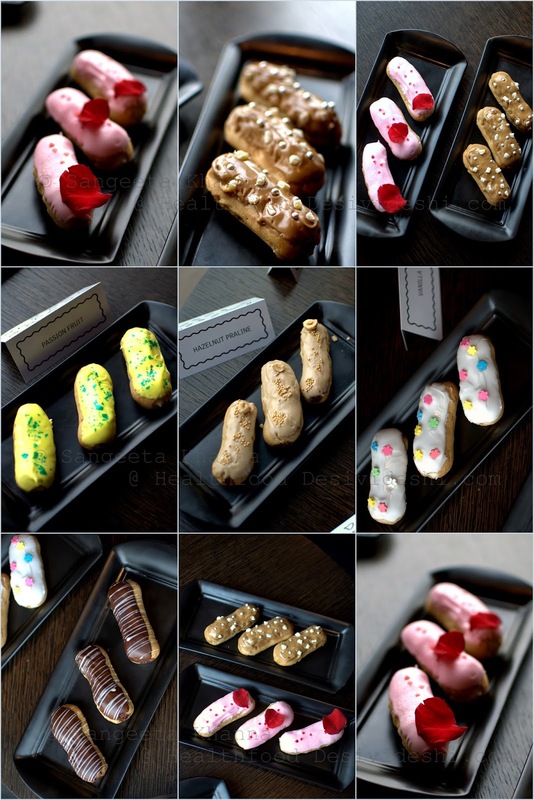 We tried our hands at filling the pastry cream into the eclairs using huge piping bags. And these were the lightest possible eclairs one can imagine. Rose and cardamom was the other Indian flavour used with the eclairs and that was great as well, even though I am not a fan of either rose or cardamom. I loved the hazelnut praline, vanilla and passion fruit flavours as well. The two local flavours were a real surprise and ginger and jaggery kept haunting me till I baked the energy bars and my home was filled up with the same aroma that I had experienced there. The husband loved these bars for breakfast with warm milk and an omelet. It had to be hot milk for me, later I added one of these bars to a smoothie with apple and milk and the result was surprisingly good. I made these bars for the next week when we are travelling and trekking in the foothills of Himalayas we would need some home baked energy bars as we never like buying packaged stuff even when travelling. Fruits are the best bet otherwise. The best thing about this energy bar is, it has just 5 ingredients that can be mixed in a food processor bowl and the dough is ready to be patted onto a baking tray and baked right away. Be ready to have heart warming aromas in your home, ginger was never so delicious. Mince the ginger finely, keep aside. Run the oats along with the minced ginger in the food processor or mixie jar so it gets powdered nicely. Cut the cold refrigerated butter in small cubes and tip them all the the food processor and let it all make a dough. Add the amaranth flour and mix once again. Now add 2 tbsp water (not a single drop more than this) and run the food processor once again to bring the flours together like a dough. Preheat oven at 170 C, Line a baking tray (12"x10") with silpat or greased parchment paper, dump the dough over it and pat it into a thin sheet of even thickness Use a spatula if required, fill in the corners well and smoothen the surface nicely. Mark the bars using a sharp knife, taking care not to go deep as silpat may be damaged. Bake for 25 minutes and leave the tray inside the oven for 10 minutes more. Invert it over a large chopping board or a smooth surface. Let it cool for 10 minutes and cut the bars using a sharp knife over the markings. Cool completely over wire rack and store in airtight container. I am saving these bars for the journey. I had made these oats, coconut, flax seeds granola bars once for another journey to the same place. Those bars were cooked in a pan but these ginger and jaggery energy bars wont be bale to be made without baking. I am saying so because I keep getting requests for pan cooked recipes too. 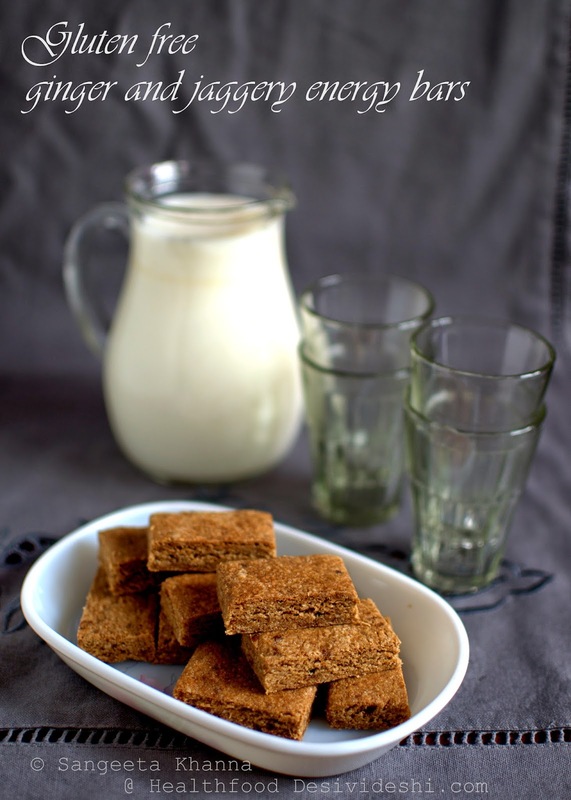 Sadly for these ginger and jaggery bars baking is the only way to make them. But the good thing is, they are the easiest thing to do in an oven. Do let me know of you liked them. I keep baking such bars often with many gluten free flours, will be sharing them all very soon, sometimes I don't get to click pictures, sometimes I had not taken note of the quantity of ingredients and sometimes recipes just keep waiting endlessly. You will be seeing more of those recipes as part of 101 alternative grains series here. Please leave a word here if you are liking these posts. Very healthy and tempting bars.. looks awesome!! Sounds pretty easy and delicious. I don't have an oven, but a microwave. Can it be made in microwave? 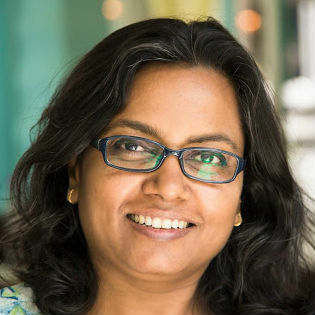 I love these bars, Sangeeta. They seem mouthwatering. Once I come back from vacation, I promise you I will make them. Look forward to meeting you. Love the simplicity of your recipes as always! I made them, Sangeeta. They were delicious but mine were a bit crumbly. Also they started turning dark very quickly in my OTG. Since I do not get Rajgira flour very easily, is there something else that I can use in its place? Thanks. Rachna...coarse wheat flour should work well and even ground oatmeal too. Hi Sangeeta, I'm not sure if my comment worked as I was trying to comment very late last night!! Anyway, I was saying that I am actually looking of a good recipe for health/muesli bar to put in my son's school lunch box. Now I found one :-) I like the idea of using jaggery too, my husband is always saying it is so much better for you than any other sweet product. Another great recipe Sangeeta! I brought a pack of organic amaranth inspired by one of your posts and now I am using it popped in my salads. Even though I had heard about rajgeere ka atta, we didn't really use it at home. In our house, kuttu or singhade ka atta was brought during navratris. Really want to try out recipe.. For jaggery, you mentioned powdered.. where I live we two varieties one is in solid blocks (can be grated I think), the other more sticky and more pasty/doughy.. I'm guessing the first one should be ok for this recipe, wondering how its moisture content may affect the final product since you used powdered? Aditi you can use any kind of jaggery provided you can mix it well with the flour mix. The solid pellets of jaggery can be grated or chopped and be processed along the flour in a food processor. You see I used 2 tbsp water to bind the flour mix into a crumbly dough, you can adjust the amount of water according to how your brand of jaggery behaves. Hope it helps.